By kind permission of Elder.com, the website of the recognized trader, Alexander Elder, I reproduce for you, literally, its article "Books and Trades #252: Current market, Thanksgiving Special" of November 21st, about the actual behavior of the market and his outlook for the next months. I haven’t written to you in a while, but felt compelled to do it today, in view of the current market situation. This pattern is intact on this weekly chart of the S&P as well as the Dow (not shown). The bottoms of severe corrections are usually retested on lower volume. The latest decline was just such a correction. The Nasdaq (not shown) had actually nicked its October low before recoiling and rallying. This is very similar to what happened in February 2016, when only the Dow among major indexes had nicked its previous low. 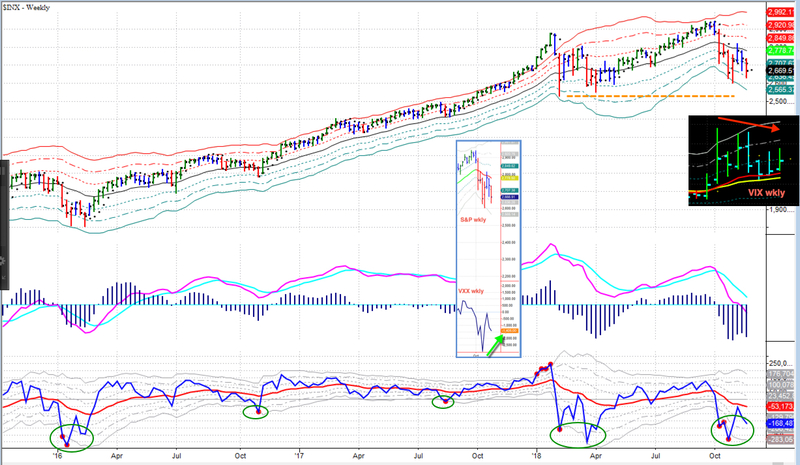 The second bottom of a correction is almost always confirmed by multiple divergences. The inset in the center of the chart shows a bullish divergence of the New High – New Low Index. The dark inset on the right shows the weakening of the Fear Index. This bull market is definitely getting older (aren’t we all) and more ragged. At some point it will top out, creating great shorting opportunities, but that time is very unlikely to be now. To see what goes on day to day, I recommend joining SpikeTrade.com, where I post several times each week. Take a Trial to see how much you can learn. Another invitation: join my private webinars at elder.com to see live market analysis and receive answers to your questions. 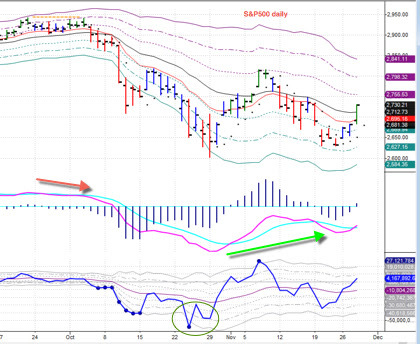 Here’s the weekly chart of the S&P I sent you last week, followed by today’s daily chart (drawn around 2pm). The headline of my post in SpikeTrade on Monday was “Had the corrective move been completed?” I presented evidence for both sides, answered affirmatively, and shared my long purchases. The ensuing rally went into high gear today, crossing above the value zone, gathering steam. Don’t you wish you were receiving daily SpikeTrade posts. The reasons for this reminder: a) in tonight’s webinar we’ll focus on stock selection and b) our Thanksgiving special will end on Friday.